Printed circuit boards (PCBs) are plastic boards that connect electronic components together. An electronics manufacturer will often make use of a technique called V-scoring when creating a PCB to keep costs respectable and streamline the fabrication process. 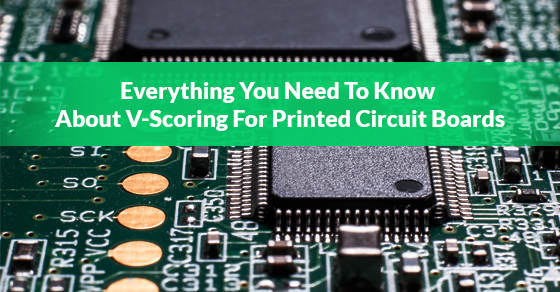 Although V-scoring is an important part of PCB creation, most people don’t know exactly what it is. So, what is V-scoring? Sometimes referred to as V-groove scoring, V-scoring involves cutting a V-shaped groove at both ends of a circuit board but still leaving a minimum amount of material to ensure that the printed circuits remain joined. This technique is used by an electronics manufacturer to mechanically pre-separate circuit boards. V-scoring must be done with absolute precision. The layout of the circuit board spacing should be 0.0 mm, and the scoring lines need to be straight. However, vertical or horizontal lines can be used as long as they run from the outer edges of the board. Furthermore, in order to ensure stability, scoring should only be done above a minimal circuit board with a thickness of 1mm. If the printed circuit board is thinner than 1mm, one-sided scoring can be used. V-scoring is used by an electronics manufacturer to group a set of circuit boards together. This helps make the assembly process run smoothly by providing a solid structure that only allows for the application of minimal pressure to be applied when the assembled boards need to be separated. Another technique, kump scoring, is used to program a length for the score line and then jump over a programmed section of the circuit board. By using jump scoring, you are left with a rigid assembly panel that can actually be de-panelled quickly without damaging the sensitive parts of the board like the solder joints. V-scoring offers major cost benefits to electronics manufacturers. By eliminating the spacing needed for routing, usually .062”–.250”, you have extra room to add more rows of boards to the fabrication panel. In doing so, you practically eliminate wasted laminate and can reduce the number of panels that require processing. V-scoring saves time and money by streamlining the fabrication and processing method. For more information about V-scoring, please contact us. We are an electronics manufacturer that provides pre-manufacturing, manufacturing and post-manufacturing solutions.